No COO 1982 on back of legs. Does not include stand. YOU WILL NOT BE DISAPPOINTED AS WE PRESENT WEEKLY. Everything is 100% original and authentic. Small tear in cape by left arm hole. A must for any fan or collector! 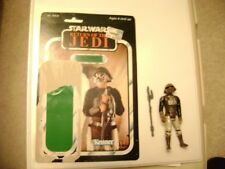 $Up for sale is a Star War The Power of the Force Lando Calrissian in General's Gear with Blaster Pistol action figure toy by Kenner. 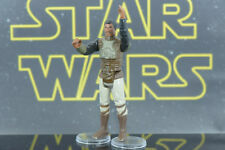 The Lando Calrissian action figure comes new in original packaging and box. ---The Star Wars Lando Calrissian in General's Gear with Blaster Pistol Action Figure Toy by Kenner can be yours for 14.99 ---Free shipping for this item with delivery confirmation included via USPS First Class Mail and you can upgrade to USPS Priority for 4.99 ---Comes new in box original packaging ---Made by Kenner ---Star War The Power of the Force (Green Card) ---3.75 Inches long ---Collection 1 ---Made in 1997 ---Includes Blaster Pistol ---Freeze Frame Action Slide (Actual Movie Scenes To See and Project). LFL1980 on back of Leg. Does not include stand. Trending at $7.38eBay determines this price through a machine learned model of the product's sale prices within the last 90 days. Marked LFL 1985 on the leg. Good condition. Star Wars Giclee Art Print. Printed on high-quality luster paper for the perfect balance of color depth and glossiness that really makes the artwork pop. This is for the glossy finish version. The most typical range is 2 weeks. Hallmark Itty Bittys Lando Calrissian Star Wars Solo Movie NWT Donald Glover Ltd Ed. Turn up the charm with Captain Lando Calrissian. And he's equally suave in itty bittys styling, a must-have addition to every. May the Force be with you! Expand and enhance Star Wars collections. WARNING: CHOKING HAZARD – Small parts may be generated. Not for children under 3 years. This is the Star Wars Black Label Lando Calrissian 6 Inch Action Figure produced by the good people over at Hasbro. This figure stands roughly 6 inches tall, is nicely detailed, has good articulation, and comes with an accessory. A great figure for any collector or fan of Star Wars. Recommended Age: 4 Condition: Brand New Dimensions: 6" X Star Wars Black Label Lando Calrissian 6 Inch Action Figure. LANDO CALRISSIAN HAWAIIAN SHIRT. STAR WARS CELEBRATION 2019 CHICAGO. I do appreciate your patience. IN HAND . Make sure that I communicate well and help in any way possible. Hallmark Itty Bittys Original Lando Calrissian from Star Wars Empire Strikes Back. Hello, what have we here?. Fans of all ages are sure to love this fun plush version of the smooth-talking Cloud City administrator Lando Calrissian. This is a gray Lando Calrissian T-shirt, size 4XL XXXXL. The logo is screen printed on the front and there is nothing on the back.
. UP FOR SALE IS A : (PRE-OWNED) STAR WARS LANDO CALRISSIAN AS SKIFF GUARD - COMPLETE.THIS WILL HAVE MINIMAL PLAYWEAR MARKS. IN EXCELLENT CONDITION (SEE PHOTOS) . DON'T MISS OUT AND ADD THIS TO YOUR COLLECTION ! Limited Edition Funko Star Wars Smuggler's Bounty Exclusive Collectible Pin: Lando Calrissian. This is a very limited Star Wars Celebration 2019 exclusive. Billy Dee Williams Signed Funko Pop Star Wars 291 Lando Calrissian. Condition is Used. Shipped with USPS First Class Package. Signed in sharpie. These pops were retrieved from a storage auction. I have no paperwork for them. I'm not a professional so I have tried to post clear photographs so that you can see what you are buying. STAR WARS CELEBRATION 2019 LANDO CALRISSIAN PIN FROM BLIND BOX. Condition is New. Shipping is free for the US. Will ship after the convention. See my feedback and buy with confidence. Authentically styled outfit and accessories. Released in 1996. Lando Calrissian. #240 in the series. LANDO CALRISSIAN PIN. STAR WARS CELEBRATION 2019 CHICAGO. I do appreciate your patience. This item is a Star Wars Celebration Chicago Lando Calrissian Trading Pin NIP. In hand and exclusive to the Star Wars Celebration 2019. 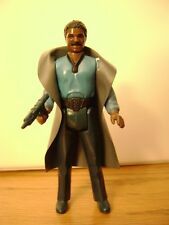 Vintage Star Wars Lando Calrissian Action Figure, No Cape. Condition is Used. Shipped with USPS Priority Medium Package. Star Wars Celebration Chicago 2019 Lando Calrissian Hawaiian Shirt Size XL. Condition is New. No returns. Buyer must make payment within 3 days of auctions end. Shipped with USPS Priority Mail. Star Wars Celebration Chicago 2019 FYE Booth Exclusive Pin - Rose. Condition is New. Shipped with USPS First Class Package. 1983 studio print 16x20 Lucas films. Black over blue matting with Star Wars font at the top of matting. (OK, so it's just an adhesive mustache. ;-) Whimsical, inexpensive gift for a Star Wars friend, though, that displays well on a wall. Only available for sale at Star Wars Celebration V in Orlando, FL, in 2010. IN HAND - SIZE 3XL - Star Wars Celebration Chicago 2019 Lando Calrissian Hawaiian Shirt . Condition is New. Shipped with USPS Priority Mail. Star Wars Celebration 2019 Pin Old Lando Calrissian Variant Blind Box. Condition is New. Shipped with USPS First Class Package. Star Wars Celebration 2019 Chicago Lando Badge Art Shirt in Men’s XXXL Condition is Brand New. Will be Shipped Free with USPS First Class. Thanks for looking! See pictures for further details. Star Wars Collector Series Lando Calrissian Figure 1996 NEW. Condition is New. Star Wars Celebration 2019 Chicago Pin LANDO CALRISSIAN Mystery Blind Pack. Condition is New. Shipped with USPS First Class Package. Non-smoking house and no direct sunlight. These are all as perfect as you could ever want. BOTTLE STOPPER LANDO. 1 BOTTLE STOPPER COLOR GOLD. (SPECIAL PRICE). The object for sale is ONE item (unless otherwise indicated). Hello everyone! Check out the photos full size to see any small details.